SAFARI TOURS are one of the special attractions at Lake Tobias. Specially designed cruisers take you across 150 acres of rolling land where you see herds of wild and exotic animals from around the world. Children young and old love to feed the animals in the PETTING ZOO. At Lake Tobias a hungry herd of friendly creatures is always eager to meet you. Come visit our Reptiles & Exotics Building and see all things scaly, slithery, and creepy that live under rocks, in trees, and in the water! 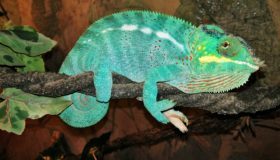 Lake Tobias Wildlife Park combines the best of both worlds as a fully operational farm and a stunning zoo with an open air safari, reptile habitat, petting zoo, and more. 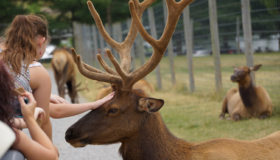 Lake Tobias Wildlife Park has more than 50 years of experience bringing visitors up close and personal to exotic animals and thrilling safari tours. Our self-sustained, family owned and operated business is proud to welcome over 170,000 patrons each season to experience life on the safari and witness an array of beautiful creatures living in the great outdoors. One of our most popular attractions, the open air safari, is a favorite of young and old alike. When you join one of our tours, you jump on our open air safari bus which takes you over 150 acres that are home to buffalo, elk, European deer, Asian deer, and many other animals. Be ready for animals to come right up to you! The 45 minute long tour covers both pasture lands and wooded areas, and you can see more than 500 mammals and flightless birds throughout the tour. Opened in 2011, our reptile and exotics habitat building gives you the chance to see a variety of beautiful creatures in man-made habitats that reflect their original climates. With educational presentations throughout the day, you will learn what makes these animals tick and even get the opportunity to touch a live alligator! The facility includes habitats for snakes, lizards, marmosets, tamarins, large tortoises, amphibians, tropical birds, lemurs, a sloth, and more. Including camels, African pygmy goats, alpacas, llamas, and much more, our petting zoo offers a variety of friendly animals that kids and adults can get to know, pet, and feed. The petting zoo booth sells cups of carrots, food pellets, or popcorn to feed to the animals. There are also coin-operated vending dispensers with various animals treats that your new creature friends will love. Four miles north of Halifax and 25 miles north of Harrisburg, we are located just off of Route 225 near Fisherville. Our address is 760 Tobias Drive, Halifax, PA 17032. Look for the Lake Tobias sign at the Tobias Road entrance. We are open daily May through Labor Day, and on weekends during September and October. We are also open on Columbus Day 10 a.m.–6 p.m. Please visit our hours page for more information. Call the Park Office at 717-362-9126 today to reserve picnic tables for large groups or to schedule a group visit. Each table is 16 feet long and reservations are $10 per picnic table.